Gather with other moms and babies to restart your yoga practice in the postpartum period. 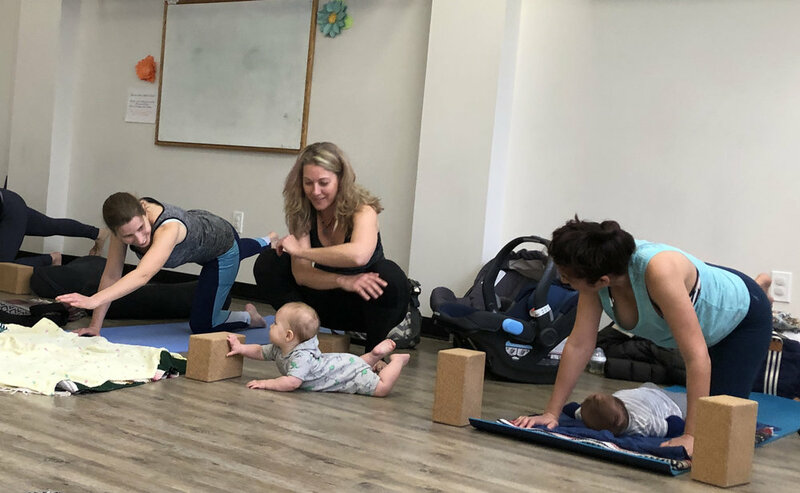 Class includes yoga and movement to aid recovery from pregnancy and birth (specific focus on core/ pelvic floor stability); discussion and community building to ease the transition into motherhood; and a fun opportunity to connect with your little one. Our Monday class accommodates babies and toddlers. If you are a mother of more than one small child, feel free to bring both. If you are coming with an infant, please be aware that curious toddlers may visit your baby. On Wednesday mornings, we limit the class to babies who are not yet mobile. Children are always honored in this class, even when they are crying, need to be changed or fed. If you are struggling with a fussy baby, you will find comfort and support here- we hold space for crying babies and tantruming toddlers. As you know, little ones are unpredictable- and so will be the flow of the class, following the needs of our children.